St. Paul, MN: Cancer patients enrolled in Minnesota's medical cannabis access program report a significant reduction in disease symptoms following the use of marijuana, according to data published in the Journal of Oncology Practice. Investigators with the Minnesota Department of Health assessed patients' self-reported symptom severity scores at baseline and again following four months of cannabis treatment. Authors reported "a significant reduction in scores ... across all symptoms" (anxiety, lack of appetite, depression, disturbed sleep, fatigue, nausea, pain, and vomiting). They concluded: "Patients with cancer enrolled in Minnesota's medical cannabis program showed significant reduction across all eight symptoms assessed within four months of program participation. Medical cannabis was well tolerated, and some patients attained clinically meaningful and lasting levels of improvement." A 2018 Israeli clinical trial reported that over 90 percent of elderly patients diagnosed with either cancer or chronic pain expressed improvement in their condition following six-months of cannabis therapy. A study from earlier this year reported that subjects who use marijuana adjunctively with conventional cancer treatment experienced reduced levels of fatigue, insomnia, and appetite loss as compared to matched controls. A literature review published this year in the journal Cancers concludes, "The complex, though moderate, action of cannabis makes it suitable for the treatment of concomitant symptoms, such as pain, chemotherapy-induced nausea and vomiting, spasticity, seizures, mood disorders, loss of appetite, which is a frequent condition in the palliative care patient." Full text of the study, "Impact of medical cannabis on patient-reported symptoms for patients with cancer enrolled in Minnesota's medical cannabis program," appears in the Journal of Oncology Practice. According to the survey, only 48 percent of Colorado companies with "well defined" drug testing policies will fire an employee for a first-time positive test result for cannabis -- down from 53 percent in 2014. Five percent of companies surveyed reported having dropped marijuana from their pre-employment testing within the past two years. "What we're seeing here is basically it's (concerns about employees misusing marijuana in the workplace) a nonissue," an attorney for the group said. 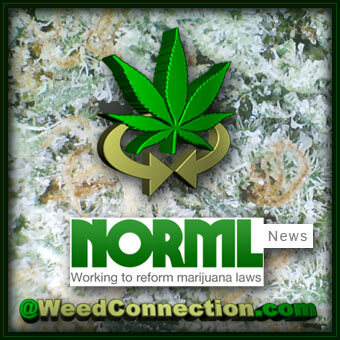 NORML's fact-sheet, "Marijuana Legalization and Impact on the Workplace," appears online. Chicago, IL: Crohn's disease patients seeking hospitalization who use marijuana possess fewer disease-related complications as compared to matched controls, according to data published in the journal Digestive Diseases and Sciences. A team of investigators from the John H. Stroger Hospital in Chicago, the SUNY Downstate Medical Centre in New York City, and the Digestive Disease Institute in Cleveland assessed the relationship between cannabis use and the prevalence of Crohn's disease-related complications and clinical outcomes in a nationwide cohort of hospitalized patients. They concluded, "In summary, our study suggests that cannabis use may mitigate several of the well-described complications of Crohn's disease among hospital inpatients and this could be due to an anti-inflammatory effect of cannabis and potential improvement in gastrointestinal mucosal healing." A prior observational study showed that cannabis use is associated with fewer incidences of Crohn's disease hospitalizations, while a placebo-controlled trial reported that cannabis therapy was associated with greater rates of disease remission. Full text of the study, "Association between cannabis use and complications related to Crohn's disease: A retrospective cohort study," appears in Digestive Diseases and Sciences. For more information the NORML fact-sheet, "Relationship Between Marijuana and Opioids." House Bill 2538, states, "The Commissioner of Financial Institutions shall not prohibit, penalize, incentivize, or otherwise impair a financial institution from providing services to a person or entity involved in a medical cannabis-related business functioning under the Medical Cannabis Act." West Virginia legalized medical cannabis access in 2016, but the program is yet to be operational.